While on one hand, we see some intellectuals worrying about the habit of reading and see it on the verge of dying; and on the other, we see a large number of authors are entering into the spectrum with their works. 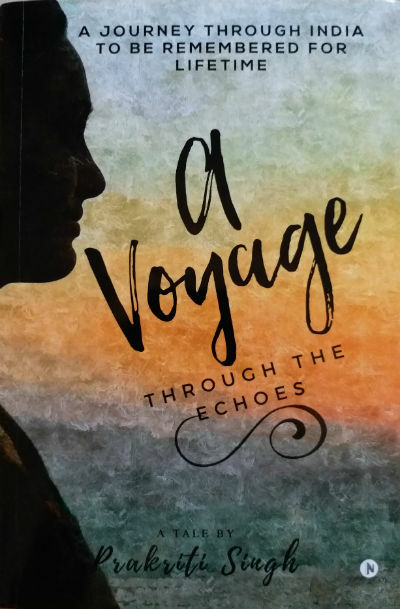 A while ago, we’ve received a book named A Voyage Through the Echoes: A Journey Through India to Be Remembered for Lifetime by debutante author Prakriti Singh. And, we were curious to read this small book. The book title is almost intriguing. However, the large stack of books in our “to be read and reviewed” list, somehow delayed its turn. Fortunately, from our team, I got a chance to read it recently. And, I am glad for the opportunity. Let me share my unbiased book review for the same. I found this travelogue quite inspirational. Here are a few more books which are quite similar to this one in terms of inspiration and motivation. Here is a book exploring travel tales we got a chance to read and review recently. Let us take a look at the book cover. We believe in the saying “Don’t judge a book by its cover” firmly. At the same time, we acknowledge the influence of a book cover on book reading and/or purchase decisions. The cover page of this book is simple yet effective. The book is about the nationwide journey through India taken by a young girl (in ear 2012). And thus an illustration of a girl’s face looking at the plains which are colored in various landscape shades on the cover page goes quite in sync with the book content. I consider it as simple and effective. The book is written in the first person. The protagonist is a young girl studying in a college. The girl grew up in a humble family and has her own point of view about many aspects of life. While studying in the college, she was offered an opportunity of traveling through India, as a study tour. Earlier she was not ready to go. She had her own reservations. Little lack of confidence, little nervousness before jumping into the real world where she was almost on her own. Of course, her fellow students and professors will also be part of the tour, but from her family, she was the only one, obviously. Anyone, who is going on a long tour, in a comparatively known yet unfamiliar group, and that too for the first time, will have the same feelings. Her family encouraged and her and she packed her bag in a hurry. She is finally going to take a tour to witness various aspects of the country as a first-hand experience. How will be her experience? Will she face some unexpected circumstances and experience in her way? Or will it prove to be one of the most fascinating and learning experience of her life? Well, you should read this book to get the answers :). “A Voyage Through the Echoes: A Journey Through India to Be Remembered for Lifetime” lives up to the expectations. The book is spread over 10 chapters. Each of the chapters (with the exception of the introductory chapter) are focused in a specific state of India which we come to witness through the eyes of the protagonist and her first-hand experiences. The book is a very small read. It is formate like a personal diary written by a college student to pen down her experiences. While talking about all the places the book has explored in detail will bring in some spoilers in this review which I consciously want to avoid as much as possible. But, some of the lines in the book are so interesting that they must be quoted. … at an age when they should have been in school they had to earn to fill their stomachs. On seeing that no one else was around, I let my emotions flow and cried for a few minutes. The protagonist’s time at Mumbai lets us travel through the city, but, it is not the regular “Mumbai Darshan”. The chapter starts with a comic situation when the students landed into a hotel due to some misunderstanding and got a very special treatment there. How embarrased they feel upon realizing the mistake is written in a way that you will love to read. The location of the stadium and the place chosen as their stay, the protagonist getting almost lost in the city and how the situation was tackled, everything in this chapter will make you remember many classic Hindi films where we used to see the characters coming to the city from small towns and villages in order to search for a better future and the experiences they have in their early days. I found the segment in the book where there are only two rooms available for the entire group to stay, quite interesting. It leads them to allot one room to the boys and the other to the girls. Now, each of them needed to share the room with every member of the same gender in the group. In the beginning, no one was ready to accept the situation wholeheartedly. However, with time, they’ve adjusted and learnt a lesson about living in a group and sharing with each other. … I felt as if plants transferred some energy to me. By now, you must have got an idea about the quality of writing in the book. The linguistic attributes are not extra-ordinary, however, the realistic way of exploring the journey and inspirational moments makes the book a definitely nice read. The photographs added to several chapters make them richer. The Instagram templates chosen for the embedded photographs goes really well. It is an additional positive point of the book. If the author could have added a detailed “about” page along with her website and social network related information, it could have been helpful to the readers to contact her. Overall, a no-nonsense, realistic travelogue which gives glimpses of the rich culture of India. It is a simple book to read. It can prove to be a good travel companion. If you already have read the book do share your remarks and thoughts via comments below. Does this review help you in making your decision to buy or read the book? Do not forget to share this article with your friends over various social networks via Twitter, Facebook and others. And yes, you may like to subscribe to our RSS feeds and follow us on various Social networks to get latest updates for the site to land right in your mail box.